A former boarding school teacher has been jailed for 10 years and nine months after being convicted of 13 sexual offences against children. 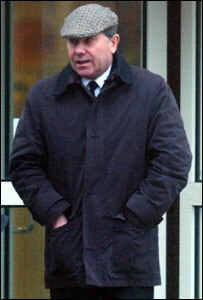 Couch, a former monk, had denied the charges at Exeter Crown Court. The offences, involving boys between eight and 13, took place between 1972 and 1993 at a now-closed Devon school. Judge Paul Darlow said Couch had committed a "gross breach of trust" and that the boys at the boarding school needed care and protection from the staff. "You were in fact a predator, a sexual predator in that community-orientated monastic school," he said. "You knew in what particular regard you would be held as a priest. "During the course of this trial you sought to portray these boys as liars. "These were not liars, fantasists, people mistaken or wrong, they were telling the truth." In mitigation, defending barrister Nicholas Gerasimides said the offences were not violent and that Couch posed a minimal risk of reoffending. "These convictions have completely ended his life," he said. During the trial, prosecutor Ian Fenny said Couch was a man who had a "dark secret personality" and "found himself in a school surrounded by temptation". Couch, who the court heard was in a powerful position of trust, taught religious studies and English and was also involved in sport and extra-curricular activities. The court heard that at the time the boys did not really understand what was happening to them. But over the years they revealed to people close to them what had happened, said Mr Fenny. One boy did complain to the school authorities in 1987, but after an internal inquiry Couch stayed in his post. The police became involved in 2004 when a former pupil on remand in prison told a prison chaplain a member of staff at the school sexually abused him. A statement has been released on behalf of the former school, saying: "We are shocked and saddened to learn that these crimes were committed and our prayers go out to those affected and their families. "We have received many communications from a great number of former pupils stating that their times at the school were happy and fulfilling and it is hoped that these findings will not tarnish those cherished memories." The school said it had co-operated fully with the police throughout the investigation. The Roman Catholic Diocese of Plymouth said in a statement after the case: "The Diocesan authorities have co-operated fully with the police investigations that have taken place. "As soon as the allegations came to light Father Couch was removed from all public ministry in accordance with national child protection policy. "Father Couch was incardinated into the Plymouth Diocese in 1995. Prior to his incardination, the Diocesan authorities were not aware of any concerns relating to his conduct and ministry. "The Diocese remains fully committed to the protection and safety of children and young people." The judge described Paul Couch as "a sexual predator"